Tennessee Valley Authority is replacing the Allen fossil plant with a new combined-cycle power plant. Image courtesy of GE. The 7HA.02 gas turbines being installed at Allen CCGT plant are the world’s biggest and most-efficient 60Hz gas turbines. Image courtesy of GE. The Allen CCGT power plant will be equipped with Toshiba's 472MW steam turbine and generator. Image courtesy of Toshiba. TVA is also constructing a 1MW solar facility, and a renewable biogas facility, at the Allen site. Image courtesy of TVA. The natural gas-fired plant is intended to replace the 55-year-old Allen fossil plant, which is scheduled to be decommissioned by December 2018. Construction of the two-on-one combined-cycle plant began in November 2015 and is expected to be operational from June 2018. It is anticipated to produce enough electricity to supply for more than 500,000 average US homes. The project also includes the construction of a 1MW solar farm and a 5MW renewable biogas facility, which will generate an additional power of 5MW. The development will require an estimated investment of approximately $975m. Allen fossil plant is located on 500 acres on McKellar Lake, Memphis, and comprises three coal-fired units with a combined capacity of 741MW. Memphis Light Gas & Water constructed the plant between 1956 and 1959. TVA initially operated the plant on lease in 1964, but went on to purchase it in 1984. The plant currently provides electricity for the Memphis area and a larger part of the western region. The new combined-cycle plant will continue to provide electricity for these regions, which are covered by TVA. Allen’s three coal-fired units will be retired in accordance with the US Environmental Protection Agency’s (EPA) December 2018 deadline for the reduction of coal emissions. The new facility represents the third replacement combined-cycle plant scheduled to be built by TVA in order to comply with the new air pollution regulations. The new plant will be equipped with GE’s latest 7HA.02 combustion turbine technology, which utilises the world’s biggest and most-efficient 60Hz gas turbines. The 7HA technology offers a net combined-cycle efficiency of more than 61%. The turbines are supplied in GE’s prime packaging, a modular packaging configuration that minimises the period of time required for installation. Allen plant’s simulator will feature the latest ProTRAX 7.4 modelling system, two GE 7HA.02 gas turbines and two heat recovery steam generators (HRSG), as well as one Toshiba steam turbine generator and related controls. The simulator is equipped with virtual Emerson Ovation, virtual GE MarkVIe and translated Toshiba controls, and helps during the testing of equipment prior to installation, thereby achieving an early plant commissioning. The 1MW solar facility is expected to produce first power in September 2017. It will be the TVA’s biggest solar project in its service area. TVA has partnered with the City of Memphis to capture methane gas from the T.E. Maxson Wastewater Treatment Plant, which is located adjacent to the new CCGT plant site. The methane gas will be cleaned, dried and transported to the CCGT plant, where it will be burned in an auxiliary boiler to produce steam. The steam will then be used to run the turbine, generating enough electricity for at least 3,000 homes. Natural gas for use in the new combined-cycle plant will be sourced by Memphis Light, Gas and Water (MLGW) via a new pipeline, which will be built within an existing right-of-way along the MLGW gas pipeline corridor. The plant is expected to require between seven and ten million gallons of water a day for condenser cooling. In addition to the installation of groundwater wells, TVA is expected to purchase water from MLGW, which will be used to meet any additional water requirements during peak times. The operational procedure of the two combustion turbines at the new Allen combined-cycle plant is comparable to that of jet engines. The GE turbines draw air, compress and mix it with fuel, and finally ignite. Each turbine will be connected to a generator. Hot combustion gases are captured from the turbines, and subsequently combined and used to generate steam to drive a single steam turbine, which will produce an additional 50% output compared to the combustion turbines alone. A catalytic converter will be used during the process to remove carbon monoxide, while a Selective Catalytic Reduction (SCR) system will be used to remove nitrogen oxides. TVA will construct and operate two new 161kV transmission lines and use the existing 161kV switchyard. The proposed transmission lines will be located between the existing switchyard and the new combined-cycle facility to connect to MLGW’s regional transmission system. 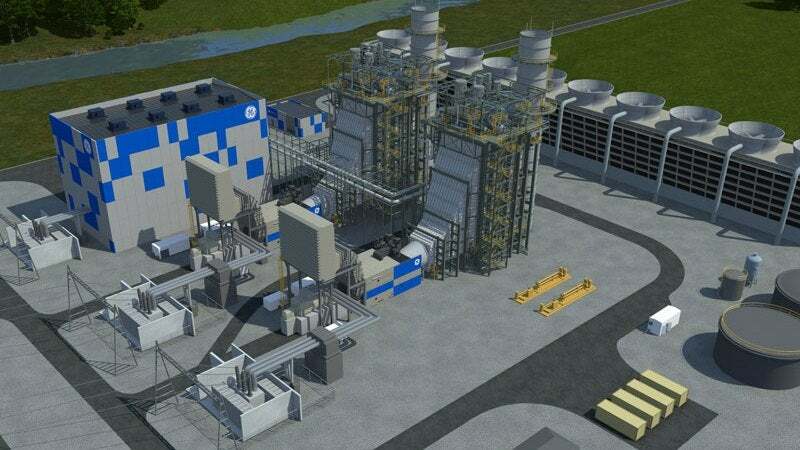 GE is the supplier of two 7HA.02 gas turbine generators for the Allen combined-cycle power plant, while Toshiba will supply a 472MW steam turbine and generator (STG). TVA contracted TAX for providing the simulation system for the plant. IGP Generatoren supplies emergency power generators, continuous duty generators, rental generators and combined heat and power units (CHP).